This post made possible through the support of Cochlear. All opinions are my own. I have been working in the school setting for over 17 years. As a school nurse I have seen a lot of children enter school with very limited language skills. I know first hand the impact that these deficits cause in the learning environment. 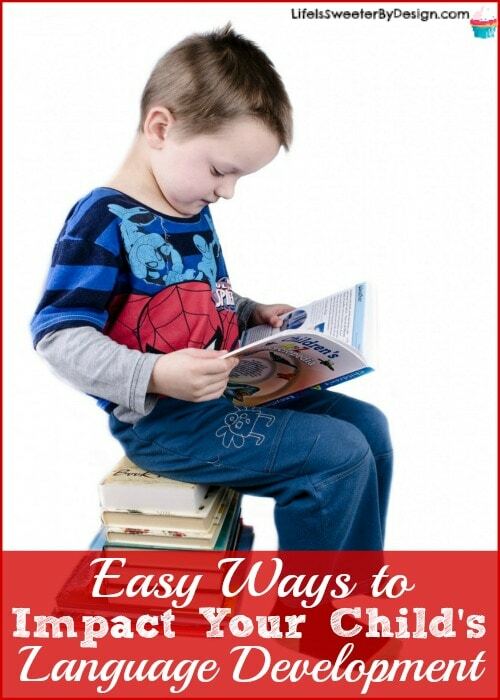 I want you to know there are easy ways to impact your child's language development. It sounds so simple, but talking to your child is one of the easiest ways to impact your child's language development. From the moment your child is born you should be talking to them. The more words they hear the better their educational outcomes will be. You can sing to them, read books to them and just talk, talk,talk! Studies show that children need to hear 30 million words by the time they are 4 years old. (1) There is actually a wonderful initiative called Thirty Million Words that has the sole mission of helping decrease the achievement gap by working with parents to give children their best start in life! Head over to the Thirty Million Words website to find a wealth of information and resources for parents to help you reach your goal of having your child hear at least 30 million words before they turn 4 years old! The limits of your language are the limits of your world! Did you know that there are actually milestones for speech and language? Many parents are only focused on developmental milestones like rolling over, sitting up, crawling and walking. There are actually some other very important milestones that need to be monitored so that you know if your child is on track for their language development. 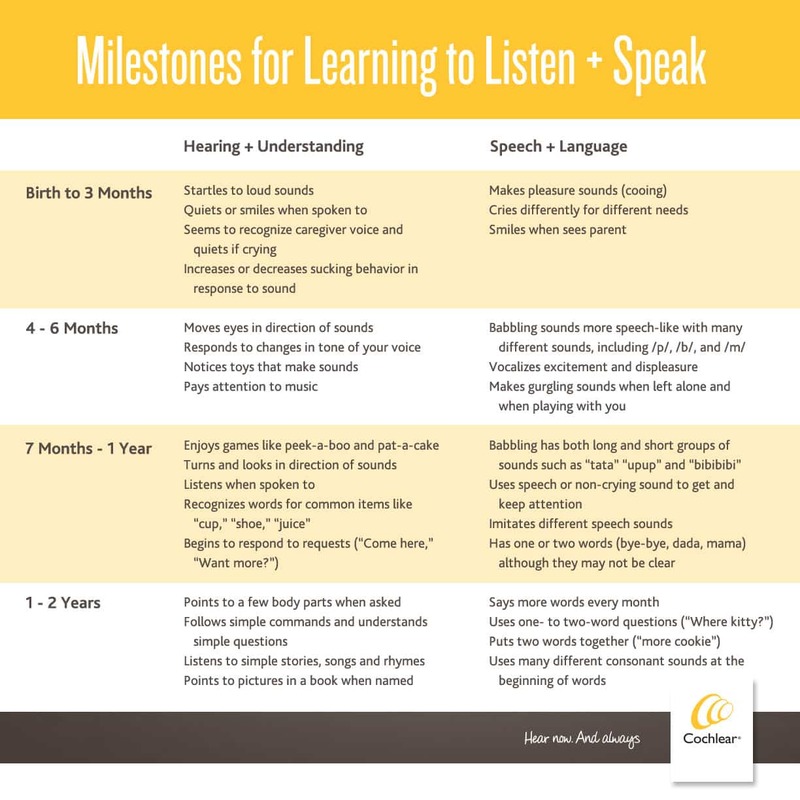 Here is a great chart from Cochlear to help you recognize what speech and language milestones your child should be meeting! Click on the image to download and use at home! One of the biggest factors involved in language development delays is hearing loss. 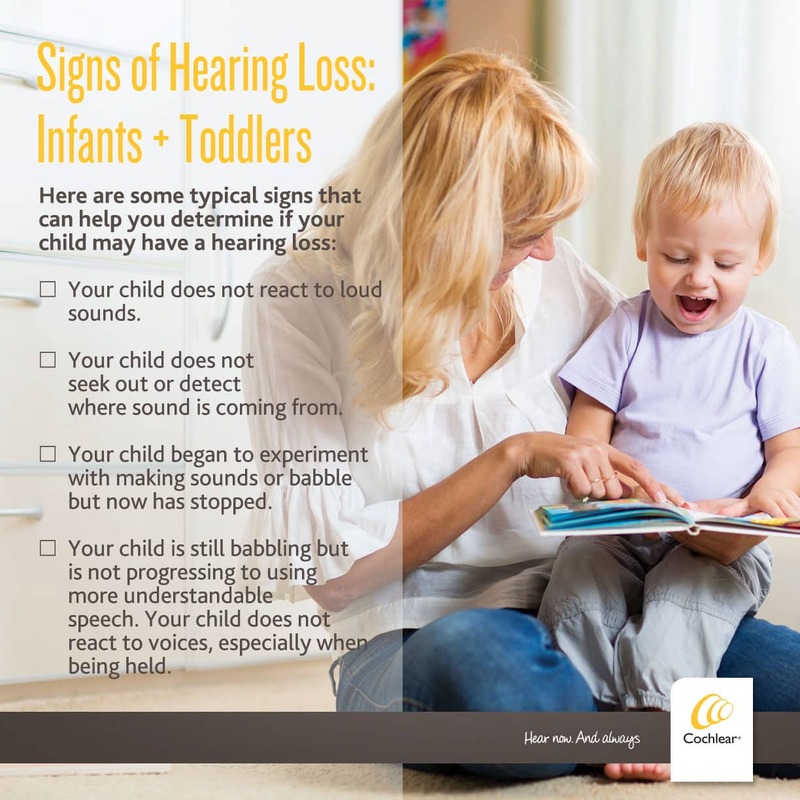 It can be harder to identify hearing loss in infants and young children if you are not aware of the signs! Children with hearing loss do not develop language like they should and this delay can have lasting effects on their education and even social interactions! Did you know that hearing loss is the 2nd most prevalent global health issue, affecting more than those with Parkinson’s, epilepsy, Alzheimer’s and diabetes combined. (2) Hearing loss is a real concern and it affects people of all ages! The chart below from Cochlear will show you the signs to watch for so you can catch any hearing issues early! You can download these signs of hearing loss by clicking on the image below. The first few years of life are critical for so many areas of development. The consequences of delaying treatment if an issue is found can be devastating. If you notice that your child is not developing their speech and language like they should be or you sense there is a hearing issue going on, you need to act quickly. The sooner interventions start taking place the quicker your child will be able to get back to developing the skills they need for their whole lives. There are many resources available for parents today. One wonderful resource is the website I Want You to Hear that was created by Cochlear. This website is a great place for parents to find out about hearing loss and hearing solutions. Cochlear is passionate about connecting parents who want their kids to have access to hearing to help with language and development so they can live their lives without limits. Cochlear can provide parents with the online support, information and the connection they are looking for around hearing loss. Cochlear knows that communication is the crux of everything in parenting and wants to be a partner to families of children with hearing loss for their lifetime! In my experience as a school nurse, children who have had early intervention for their language delays and hearing issues have done much better in the school setting then those children who weren't treated quickly. Every child deserves to have their best chance at success and early interventions can help so much! If your child has hearing loss be sure to look at all the options available. You can find out more information about treatments for hearing loss and even find a hearing specialist at the I Want You to Hear website. This video about Patrick is so inspirational and shows the power of early intervention! What is your experience with language development and hearing loss? Do you know anyone who has been able to overcome obstacles in these areas? I would love to hear your stories! !